Matt Mullenweg gives us a peek behind the WordPress curtain. 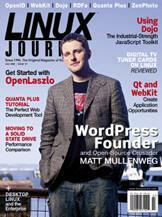 We find out what's new in blogging, how WordPress evolves, and his feelings about open source. Blurring the lines between the desktop application and the Web. OpenLaszlo's goal is to add desktop-like functionality to browser-based applications. The why and how of using RDFa to add semantics to your site. Is a solid state drive worth it? In this article, Kyle Rankin pits a 1.8" 4200rpm drive against an SSD in a series of real-world Linux tests. Can Linux finally make inroads onto the enterprise desktop? A tutorial on doing it all with Quanta Plus, the open-source Web IDE. Marcel Gagné's Cooking with Linux You Look Marvelous on the Web!